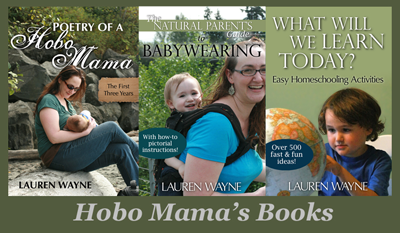 Hobo Mama: Support a favorite writer this holiday season while you shop on Amazon! Support a favorite writer this holiday season while you shop on Amazon! Annual reminder: As you buy the items on your holiday list this year, keep your favorite bloggers in mind! 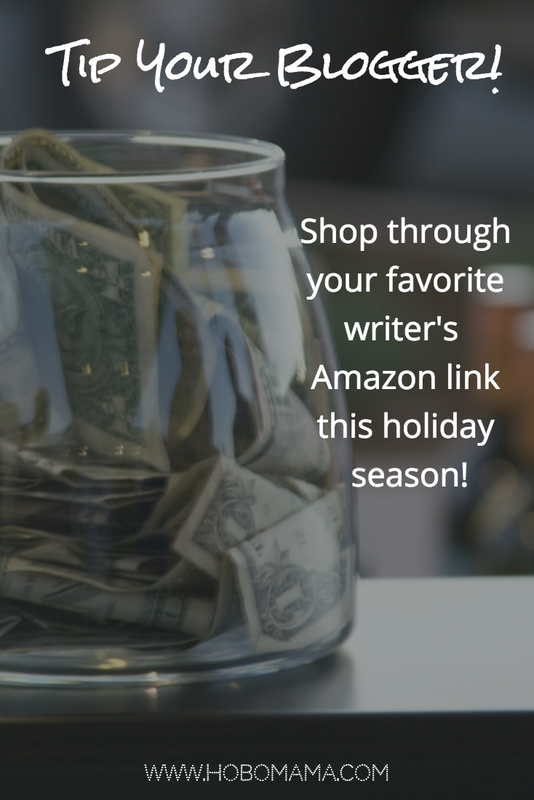 If you're shopping online at Amazon.com, you can shop through your favorite writers' affiliate links and give them a little holiday gift, too! Buying through an affiliate link works just the same for you as shopping by going directly to the Amazon site. You don't pay any more than you would otherwise, but the store itself funnels a few cents over to the blogger as a thanks for the referral. Do you know bloggers who are struggling this season to make ends meet? Are there writers you'd love to reward for being particularly timely and touching in what they share with readers? Do you just want to spread the holiday love and cheer? Then make it a point to shop through an affiliate link this season and throughout the year! 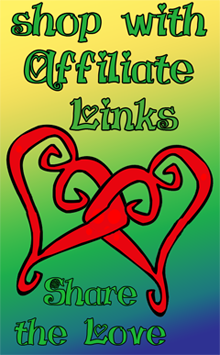 To make it easy for you, we have a linky list of bloggers' Amazon affiliate links. If you're a blogger, sign up with your links! To help you remember to shop through an affiliate link, bookmark a few! Simply drag two or three favorites into your bookmarks bar, and name them "Amazon." Now anytime you want to go to Amazon, click on one, and you'll be set to give that blogger a little tip for being awesome! Need more info on affiliate-link shopping? Check out our frequently asked questions below! The linky lists have a permanent home on Hobo Mama's Support Bloggers page if you want to add your own link. But I'm reproducing the list here for your shopping convenience! To enter: Put your blog name in the Title field and your affiliate link to the Amazon homepage in the URL field. To use: Click on one of these links every time before you check out at Amazon! Oh, The Things We&apos;ll Make! If you need any of your links edited or removed, let me know through my contact form. 1. How do affiliate links track my purchase? When you click an affiliate link, your browser stores a cookie that tracks any purchase you make from that point to the cookie's expiration date. Amazon's cookies expire quickly, after 12 hours. Other stores have cookies that last 30 days to 90 days (usually). You'll reset a cookie if you click on someone else's link before checkout as well. It's best to click the affiliate link you want just before checkout to make sure it's active and the one you want. 2. Do I pay extra when I shop through an affiliate link? Not at all! The store pays the affiliate fee out of its own earnings, as a thank-you for the blogger's referral of a customer. 3. Is my shopping experience different if I shop through an affiliate link? Nope! Once you click the link, you're on the shop's website, same as always. You can browse around, update your account, enter any coupon codes … same as before! The tracking cookie is invisible and doesn't affect your shopping or checkout experience at all. 4. Shouldn't I just shop through my own affiliate links? You can't make sales through your own affiliate links on Amazon. Other stores might have different policies, but Amazon simply won't track them. If you're found illegally manipulating accounts to do it, you can be kicked out of the Amazon Associates program for good. So it's worth it to shop through some other lovely person's link and spread the wealth! Feel free to display a button in your sidebar, pin to Pinterest, share on Facebook, and just generally let everyone know to shop through YOUR affiliate links! As you buy the items on your holiday list this year, keep your favorite bloggers in mind — including me! If you're shopping online, particularly at Amazon.com, you can shop through my affiliate links and give me a little holiday gift, too! Buying through an affiliate link works just the same for you as shopping by going directly to the Amazon (or other shop's) site. You don't pay any more than you would otherwise, but the store itself funnels a few cents over to me as a thanks for the referral. If you want to reward the writers you love and spread the holiday love and cheer, make it a point to shop through an affiliate link this season and throughout the year! 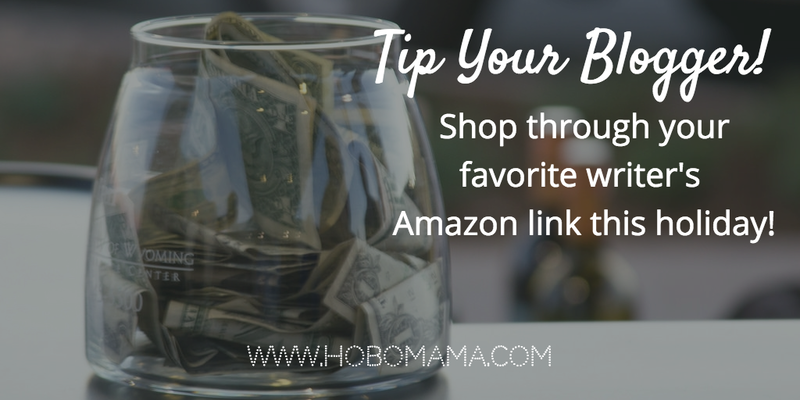 To make it easy for you to find my link and those of other fabulous bloggers', Lauren at Hobo Mama has a linky list of bloggers' Amazon affiliate links, as well as a linky of affiliate links to other popular online stores. You can find those lists at Hobo Mama's Support Bloggers page. If you're a blogger, sign up there with your links! When you're shopping on Amazon, just before you check out, head on over to the page on Hobo Mama and find my blog's name in the linky list. Click, check out, and you'll be giving me a sweet little tip! Thank you so much for your support of my writing!